Lain asks for a new NAVI in Weird. Iwakura Yasuo (岩倉 康男 Iwakura Yasuo) is the surrogate father of Iwakura Lain. 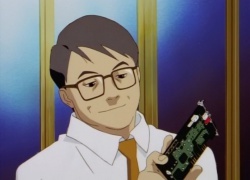 He's a Tachibana Laboratories employee, seen working on IPv7 with Masami Eiri in a flashback. He is proficient with computers and has a high-end NAVI with multiple screens at home. In Layer 01 Lain approaches him -- a rare occurrence, according to Yasuo -- and asks for a new NAVI. He is amused by and encourages his daughter's new-found interest for NAVIs and the Wired, approving her request due to her own machine being rapidly outdated and that she should not be afraid of the growing societal emphasis on the Wired. He asks Lain why she is interested, and she replies that she has to meet a friend. In the next episode, Yasuo informs Lain that her NAVI has arrived, and Miho says to clean up quickly due to the hardware blocking the way. Yasuo offers to set the NAVI up for Lain after dinner, commenting that the new model is so powerful that he would like to use it himself. His daughter asks if he can set it up now, surprising him, but he complies. Just before Lain begins using her NAVI, he warns her not to use it too much with kids, championing the importance of more 'advanced' communication systems in more mature relationships. His daughter does not reply, instead addressing her NAVI, and Yasuo says that she can show off her new NAVI to her friends. In Layer 03 he interrupts Lain before she can read her mail, asking her if she has gotten used to her NAVI. When she doesn't respond he asks if there's something wrong. She shows him her new device and asks if he knows what it is. He responds coldly that he doesn't know. In the next layer he is first seen watching Lain's flurry of activity on her NAVI. He confirms to Miho over dinner that Lain is acting "weird". Later in the episode he confronts Lain and warns her that the Wired is just a communications platform, and should not be mixed up with the real world. Lain responds firmly, saying that "The border is not so well-defined. Soon, I'll be able to enter it and I'll be metaphorized completely with full range and motion," and when he says that even the newest commercial NAVI cannot simulate reality, his daughter states that she can because she modified it. Yasuo asks if that is because of her Psyche chip, and Lain assures that she will always be herself. 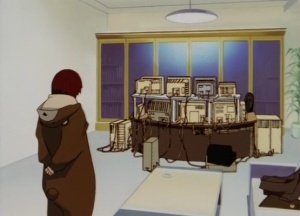 "Yasuo" discusses the Wired with Lain in Distortion. Yasuo is less prominent in the fifth episode, paying little attention to Mika when she asks if Lain was in Shibuya earlier. 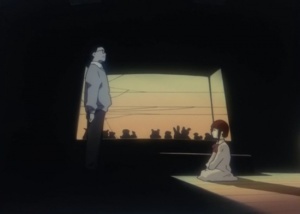 However, in Lain's room he manifests as a pale, ethereal figure and she asks if he is really her father. He talks about the Wired, and theorizes that the development of electricity and phones, which brought about the Wired must have created another world. They then discuss the existence of a God, only a concept in the real world while a Deus-like entity may lurk in the Wired, of power "...that is written of in myths". He then says that it is possible that such an entity could affect the real world, perhaps by a "prophecy". In Layer 06, Yasuo is shocked by the changes in Lain's room, pockmarked with puddles of water and filled up almost completely with hardware. His concern is magnified when she does not seem to notice him. Yasuo does not appear in the next episode, though the Boss mercilessly interrogates Lain using details of her supposed family. After not appearing for four episodes Yasuo bids Lain farewell, addressing her as "Miss Lain". He says that "our work is finished," and that she should have it figured out for herself now. Lain doesn't respond. He pities that he could not have done more for her in such a short time, but says that she is now free to become whatever she wishes, or rather, she was always free. Yauso goes on to say that though he was not allowed to say goodbye, he loved her. Lain is still speechless, and her 'father' says that he did not enjoy pretending to be a family, but says that he envied a being like Lain. As he leaves, Lain begs him not to leave her alone. Without turning to face her, he says "Alone? You're not alone. If you connect to the Wired, everyone will welcome you. That's the sort of being you were". With that, Yasuo and the rest of the Iwakura family disappear. In Layer 13, the reset returns the Iwakura family to normalcy. He tells Miho to make sure to receive and pay for a package. "Computer parts again?" she says. He doesn't reply. Yasuo is the only person that notices Lain's disappearance. He appears later, looming over a despaired Lain when she desperately questions her existence. Both Lain and Yasuo appear seated at a floating table. He says that Lain doesn't need to wear that anymore. Lain nervously asks if "knows," and that "I...everyone". Her father interrupts her, saying with a knowing smile that "You love them? Isn't that right?" Lain begins to cry, and Yasuo says that he'll "...make us some nice tea next time. Hey, with some madeleines! Definitely. They're great." This page was last edited on 29 January 2016, at 00:17.